Today I added a new gorgeous French dressing table set to my Etsy shop. I had these specifically manufactured for me and I personally chose the French Blue and Vintage Pink velvet fabrics as a tribute to my obsession with the color combos of the two. (I may be overdoing this combo a bit as of late – I will eventually snap out of it, but not any time soon). The drawers open and close. Made of wood. The kidney shaped table is sold with the beautiful vanity stool. The two piece sets are listed in my Etsy shop for $155/set. You can find them here: https://divinitydolldecor.etsy.com/ VERY limited quantities available. They will also be available in my shop here at the blog, once I get the shop up and running! I love cherubs more than than the average person – I’m sure of it. It is a common theme in my photos, mostly as an accent added to the 1:6 scale furniture that I’ve customized. When I created the backdrop for my display wall for the boutique photos I shared in my last two posts, I naturally incorporated a cherub head onto the wall. I go with what I love. And like I just said, I LOVE cherubs. 🙂 I kept thinking how lovely it would be to photograph a cupid themed Barbie, with TONS of pink. But Mattel has not created a cupid Barbie. So one day recently, as I was really rushed, I put together my version of a cupid Barbie, and photographed her with the backdrop. It happened to be late in the afternoon, on the ONLY sunny day in weeks, and there was a TON of natural light shining in the doll room. Often times I move my set to another room in the house (usually my upstairs bathroom) to catch natural light. I didn’t have time for that, so I went with the strong Western sun set lighting and caught some shadows that highlighted cupid’s wings. And yes, that wig is really difficult to tame, its never cooperated with me, but its a perfect pink and I just went with it. I got over the untamed flighaways, hopefully you can too 🙂 ! I was inspired to share this photo series on Valentine’s Day – you here you go – Happy Valentine’s Day! By the way, those sconces are real, light up battery operated lights that I will blog about soon. My new fav find! Last week I posted the 2018 Valentine window display for Barbie’s French Lingerie Boutique, “La Boutique Angelique”. Here is the link to Part 1. Part 2 is a revisit of what lies behind the display wall, for those that are new to my photos and doll room. 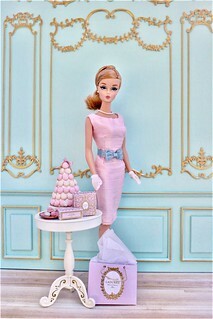 Shopgirl Barbie is still the permanent sales clerk for the boutique. 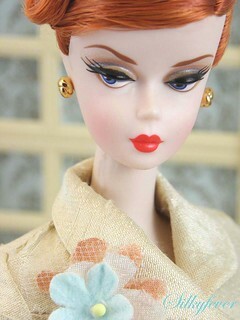 Shopgirl is easily one of my top 10 Silkstone Barbies. I freshen up the displays when inspiration strikes. The Ingenue’s lingerie is a steadfast favorite that seems to loom around on the mannequins a tad longer than the others. Every piece of furniture has been painstakingly customized/repainted by me. I also made the shopping bags and gift boxes (every purchase is wrapped in the gift boxes in cherub wrapping with pink ribbon). I really wanted to update the gift bags for this post but I had to draw the line once I realized my time constraints would not allow this project to be completed. Some day I will, and then I will share. But by all means do NOT hold your breath :). I LOVE LOVE LOVE these gold frames! Hosiery packs from the BFMC gift sets work perfectly with the lingerie theme in the boutique. This is also a My Scene piece of furniture that I customized. Look! The “Shoppers gonna shop” gals from Part 1 made it to the inside of the boutique to shop! Joan Holloway Barbie seeks advice from the Shopgirl to assist her in finding lingerie for her larger than average booty (this isn’t a mean girl moment my friends – it is in observation of Mattel’s intent to utilize a thick & full undergarment to help create a figure that resembles the shapely body of Mad Men’s Joan Holloway character, that the doll is modeled after). I wish a had an extra piece of her lingerie to display in the shop! The boutique also offers vintage lingerie. (This is Barbie’s vintage “Under Fashions” from 1966-67. I had searched for it for a very long time after I built the boutique. 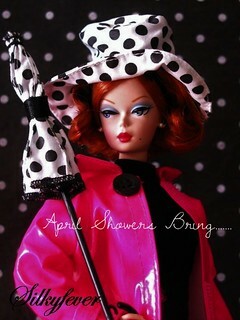 I finally found it at a doll show appx 5 or 6 years ago. LOVE this shade of pink!). As I mentioned in Part 1, photos of the boutique taken over the years can be viewed at my Flickr album entitled “La Boutique Angelique”. I leave you with a heads up that my next post will feature a photo shoot that the Shopgirl commissioned recently for a marketing campaign for the boutique featuring the window display wall seen in Part 1. In 2005 I made a permanent diorama fixture for my collection that remains a favorite of mine. At the time, I was inspired by many of the beautiful lingerie pieces from the BFMC Silkstone collection, along with several well made Barbie Fashion Avenue lingerie sets and the like. The lingerie from the BFMC are delicate works of art. I thought it would be fun to create a lovely Parisian themed lingerie shop so the beloved items could always be on display. I call it “La Boutique Angelique”. I have an album in my Flickr account you can view here if you’re interested in seeing some past photos of the boutique. I attempted to incorporate some of the elements of the inspirational BFMC photo sets when I created the boutique. Part 2 I will take you behind the window display wall, to the boutique sales floor. Recently I found myself browsing ebay auctions for Silkstone Barbies. I came upon auctions for the Silkstone Vanity. It has been quite some time since I’ve checked out the high-end price tag items in the BFMC Silkstone arena and I have to say I am stunned by the secondary market pricing for the Silkstone Vanity. Out of curiosity I ran comparables on recently sold auctions (the realtor in me shining through) and have found the average sold auctions fall anywhere between $399-500. YIKES! Should I mention that one sold for $840 in October? Current actives are well above the sold prices (typical hopeful sellers, just like in real estate). When did this exorbitant price jump happen? Maybe I’ve been asleep or just plain clueless, but I honestly didn’t expect it to pan out like this. I say this because I recall that when the vanity was first released, collectors were astonished at the MSRP : at the time, a whopping $125.00. I scanned a page from a 2004 Barbie Collectibles catalog, pictured below. When the vanity hit the market in 2004, I didn’t hesitate for a second to purchase it. At the time I was spending equally as much if not more for beautiful, good quality 1:6 scale Bespaq (or items of the like) furniture pieces, so $125.00 hardly seemed ridiculous to me. I was, and I continue to be, a major diorama geek, I was in the camp that was shouting for more 1:6 scale furniture pieces and was willing to pay the price for solid, quality furniture pieces. I only purchased one. What those collectors then could only realize now. There IS in fact a huge void in this portion of our hobby. The need for well priced, well structured furniture pieces made of durable, quality materials. Fast forward to today. In as much as I adore and appreciate this vanity, I have to ask myself if I would pay upwards of $400-500 for the piece if I didn’t already own one. It is an incredible 1:6 scale item, and I’ve been very pleased with the quality. It has held up perfectly for these past 13 years. Zero complaints. But I know that because I own one. However, I write about this because I know that at some point, new collectors will stumble upon my blog. And it is quite possible that this all new and fresh to them. So, if you are new to this hobby, and you decide that you want to seek out this piece to add to your collection, but you’re not sure if the price tag fits the crime, I’m here to tell you: do the crime. Its a big price to pay. Would I pay $800? No. But you may be in a different tax bracket than I, and then of course it is all relevant. A couple of hundred dollars for a really well made, classic, stylish piece of BFMC furniture is definitely worth it. The vanity is a treasure to photograph and display. 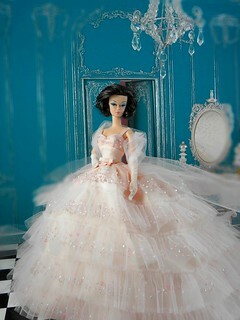 This photo is from a vignette/diorama that I photographed in 2007. Its one of my favorite photo series featuring the vanity. All of the sweet accessories that come with it are priceless. This vanity is a BFMC classic and it is a crying shame that Mattel didn’t add more beautiful pieces to the mix. Lord knows that if they would follow some of the prices of the auctions out there, they might note that there is HUGE gap to be filled, and if only they would jump in and fill it. Today I took a few photos of my vanity for this post. It was a great reminder to take time to appreciate the treasures that I do have in my collection, and share the love for a lovely piece of BFMC history.